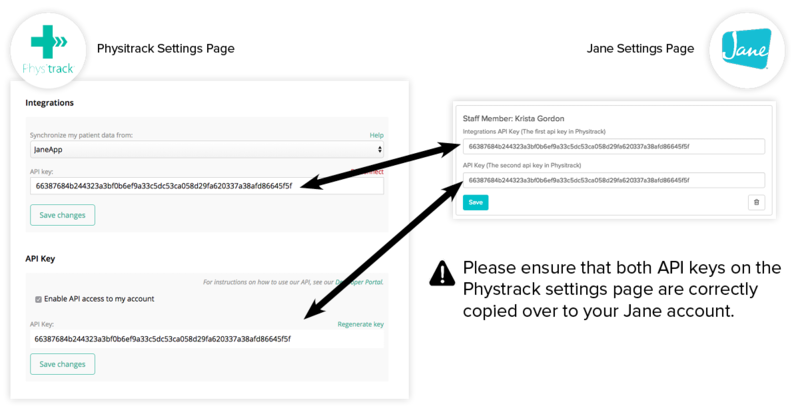 Note 1: if you have multiple colleagues in your practice, and you want their JaneApp accounts to be linked to their Physitrack accounts, each practitioner will need to login to their own account and paste in the API key into My account > Settings. Note 2: If you have a group account ("Physitrack Direct") please contact sales@physitrack.com to have global API access enabled before you go through steps 1 and 2 above. If you get an error on Jane, please make sure that the API keys on the Physitrack: My Account > Settings page match the Jane Settings page.